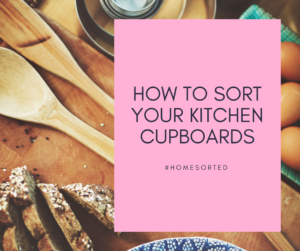 How to Sort Your Kitchen Cupboards - Home Sorted! We love the kitchen. It’s a place where delicious meals come alive and where families come together. But keeping your kitchen cupboards sorted can be an ongoing battle. Here we share with you our favourite organisation tips in the hope that it makes your life – and kitchen – a bit more sorted. The best way to start sorting your kitchen cupboards is by considering the layout of the entire kitchen. It’s important to think about where your cupboards are located, how they are positioned to the stove and refrigerator, as well as how foot traffic flows through the space. You may be wondering why we do this. The number one reason is ensuring that you have space to store essential items where they will be used. For example, pots and pans should be stored in close proximity to the stove area. A cupboard below or adjacent is perfect. The same can be said for spices and cooking oils. When sorting your kitchen cupboards, we also recommend sorting and storing items by type. This means clustering dinner sets, plates and bowls in one cupboard, cups, mugs and glasses in another. And so on and so forth. Drawer dividers are a hidden must have for any organised kitchen! Of course, they can be used to sort cutlery, but you can also use them for odds and ends, or as a way to separate Tupperware lids. If there is an avid baker in the family, we recommend creating a baking zone within one of your kitchen cupboards to sort and store baking tools and supplies. This can include baking trays and tins, icing tools, cookbooks, and supplies such as flour, sugar and cocoa powder. The latter of which we recommend storing in glass jars or plastic containers with clear labels to ensure freshness. Finally, get comfortable with a small volume of disorganisation. The kitchen is always going to be home to a small degree of chaos. This can be organised by allowing yourself one drawer for odds and ends – in a sense, a space for organised chaos! Are you ready to sort your kitchen cupboards? We sure are!